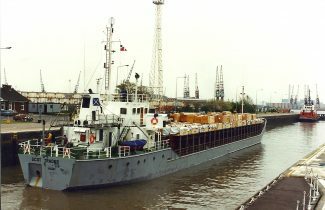 The owner of this vessel has changed a few times over the years since it was built in 1986, and when this photo was taken it was either German or British. Starting life under the name WOTAN (1585 tons gross) and owned byW Meyer of Hamburg, for charter purposes it changed name in May 1986 and was renamed SCOT TRADER … still under German flag. In August 1991 it reverted to its original name WOTAN in two years later, in 1993 was sold to a “local” firm. 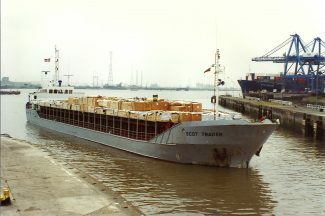 It was renamed again to SCOT TRADER, owned by Scot Trader Shipping Ltd under the British flag. Its manager was Intrada Ships Management Ltd, of Gidea Park. It was sold on in December 2008 and after a couple more name changes, it is now owned in Turkey under the name FB GLORY.